Hurrah, it's #NF10for10 2016. Here's how you do it, according to Mandi Robek at Enjoy and Embrace Learning. Thanks to Mandi and Cathy Mere at Reflect and Refine: Building A Learning Community hosting at a Google site. I'm looking forward to reading everyone's posts! Everyone will probably say how hard this is to choose. There are favorite books in every category I can imagine. 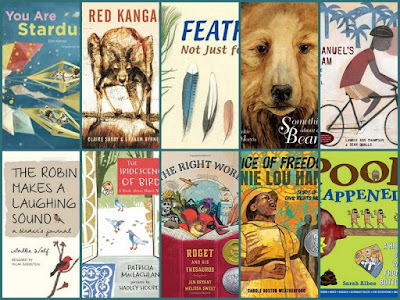 I could share books about animals or nature, inspiring people, people from history, diverse books about people, on and on. In past years, I have chosen a topic, but this time I’m going to share my recent top favorites, not always the latest, no matter the category, but adding in that these authors have published other wonderful books, too. If you like this book, there will be more to find! I'm also linking each to my Goodreads review, so if you want to know details, you can take a look. You may know most, but I hope you'll find at least one or two that looks like a "must read"! A favorite n-f author who writes longer and quite thorough texts. Great to interest older students. She's also written Bugged and Why'd They Wear That?. I do have a theme and 2 of these titles happen to be on my list! this reminds me that You Are Stardust is on my wish list. Such a gorgeous book! I tried to have a theme, & have in the past, but some of these wouldn't fit. Ha! Fun that we shared some of the same ones. There were such lovely ones in the past years. Will look for you, Carrie! Thanks for including FEATHERS on your list, Linda. It's one of my all-time favorite books, Melissa. You're welcome, and thank you for creating it! I saw Emmanuel's Dream on Carrie's list too. I haven't seen or heard of it until today. THAT MUST CHANGE! Yes, it's a wonderful story, Stacey. You will love it! 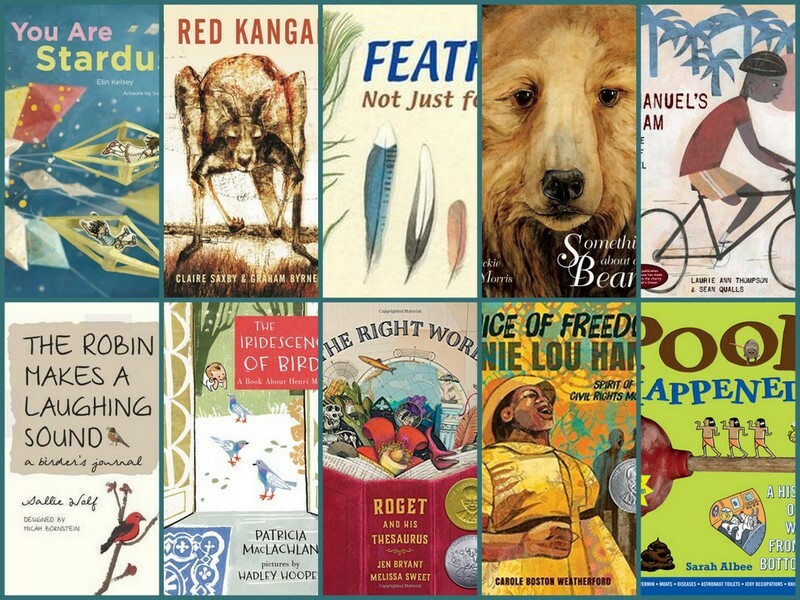 Every time we read one of your posts we learn about new books - Carrie wrote about Big Red Kangaroo too. That one is going on our TBR list. Claire Saxby's books are wonderful. The other one is Emu. Enjoy them. I certainly do. Such beautiful books, Linda - the power of words and art celebrated in each. Thanks, Tara. Wow, there are so many to love lately. I will be looking for several of these. Love the Feathers book too. I do want to read about Matisse, love his paintings. I love Matisse, too, Elsie. It's a great book. And the feathers book is just lovely. Interesting selection of books with great range. Thanks for the list. You're welcome, Tammy. Hope you found some new ones to read. What a great list! There were several new to me titles here. I'm busy reserving a few. 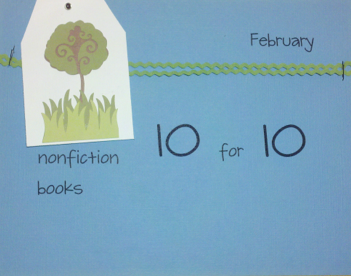 I have to smile at the number of amazing nonfiction bird books. Glad it is almost spring and we'll soon be seeing all of our bird friends in action again. I love the way you take the time to write the Goodreads review and linking to that review was so smart. I wish I would take the time to do the same. I'm so glad you joined us again this year. Thanks, Cathy, and for taking the time. Enjoy the books new to you! I know you're at the conference, so am amazed you have time to comment, too. Amy L-V's book about birds comes out this next week, too!